In a nutshell – if you can feed us – awesome. 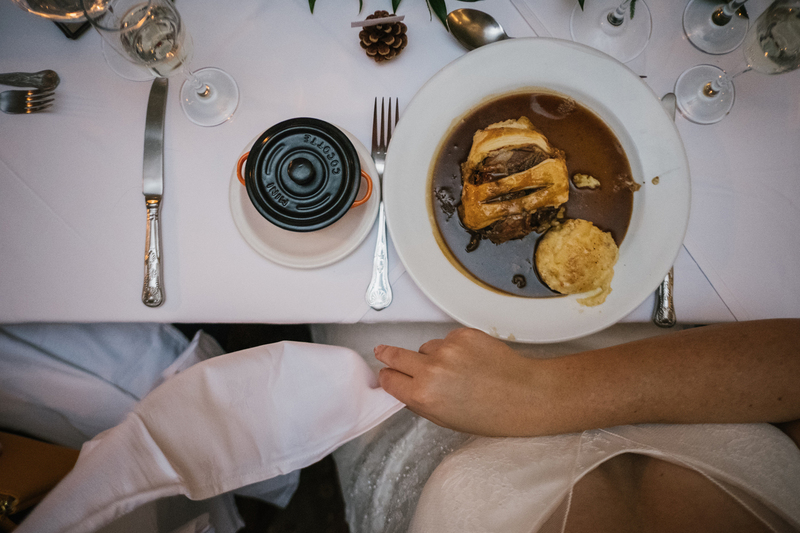 We spend an average of 8-10 hours loaded with kit at each wedding we shoot and when we’re fed, we’re so much happier. It doesn’t have to be a full 3 course meal; one course, a bar meal or a sandwich is absolutely fine. We don’t take the mick and the opportunity to rest our feet is most welcome. The most important thing is that we can scoff when you are, so we’re not being fed when the speeches are happening. If we can sit with your guests that’s even better as we can be ready to strike if anything exciting happens. No one really enjoys being photographed while having their dinner, so we keep our snapping to a minimum at this time. If we don’t get fed, we have to go and fend for ourselves, which can take us away from the action and we hate that. Most venues won’t let us bring our own food and sitting in the car trying to eat is never a fun game. Even if we’re having a break, we never truly stop. Our heads are constantly on a swivel looking out for a cool moment to photograph, a neat bit of framing to take advantage of or some killer light to catch people in. It takes us about three days to recover from shooting a wedding, we pour our hearts and souls into it, so anything that helps keep us going is gratefully received.